Looking for ensuite accommodation for over the summer months in 2019? Our Bainfield and Orwell apartments could be what you're after. Our Bainfield Accommodation has a range of studios and four, five, six, seven and eight bedroom self-catering flats to rent from late June to late August each year. We also have a small number of private studio apartments. Each bedroom has a private en suite and all flats have a fully equipped shared communal kitchen/lounge area and flat screen televisions and WiFi. Based in the Fountainbridge area, Bainfield has seven blocks of flats in total with each block having a lift for easy access. For your convenience, a Sainsburys grocery store is located onsite at the accommodation so that you can stock up on any essential food supplies. Bainfield is directly opposite the Fountain Park Leisure Centre which boasts a cinema, gym, tenpin bowling alley and a range of restaurants, bars and pubs. 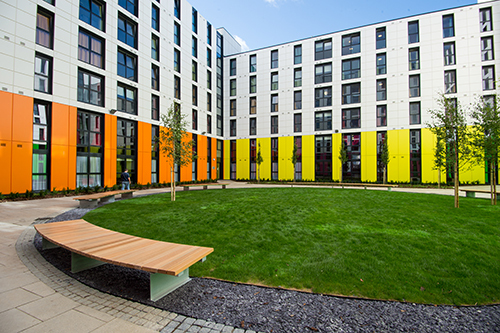 With 117 flats at Bainfield totalling over 700 beds there are plenty of options to suit all summer guests! Please call 0131 455 3711 or email vacation.lets@napier.ac.uk to check availability and for further information. We have a range of four, five, six, seven, eight and nine bedroom self-catering flats. Each bedroom has a private ensuite bathroom and all flats have a shared communal kitchen/lounge area with flat screen television and WiFi. We also have a small selection of twin bedrooms with shared en suite. 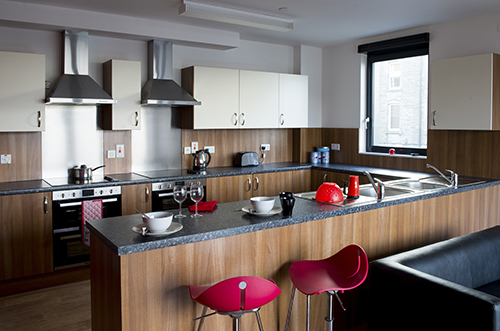 Based in the Dalry area, Orwell has four blocks of flats in total with each block having a lift for easy access. For your convenience, a range of local amenities are close by. Orwell is 5 a minute walk from the Fountain Park Leisure Centre which boasts a cinema, gym, tenpin bowling alley and a range of restaurants, bars and pubs. With 35 flats at Orwell totalling 246 beds, there are plenty of options to suit all summer guests! Please call 0131 455 3738 or email vacation.lets@napier.ac.uk to check availability and for further information.